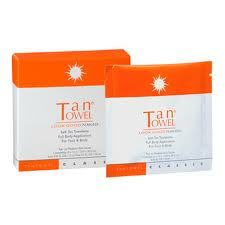 Tan Towel Full Body CLASSIC Self-tanning towelettes are the perfect option for fair skin or beginning tanners. TanTowel provides a natural looking glow that is simple to apply, with no odour or mess and it does not streak. One towelette will cover the whole of the body. The pulp fiber exfoliates as you apply leaving your skin soft, smooth and evenly tanned. You gauge the level of tan by the number of towelette applications. TanTowel has a refreshing citrus scent but will not compete with perfume or cologne. The fragrance will dissipate within 5 minutes. • Creates natural colour gradually. • Works with the proteins in your skin to ensure a gradual, more natural looking appearance of color. Water (Aqua), Ethoxydiglycol, Dihydroxyacetone, Butylene Glycol, Tocopheryl Acetate, Melaleuca Alternifolia (Tea Tree) Leaf Oil, Cucumis Sativus (Cucumber) Fruit Extract, Ascorbic Acid, Polysorbate 20, Sodium Metabisulfite, Fragrance (Parfum), Citric Acid, Tetrasodium EDTA, Propylparaben, Propylene Glycol, Methylparaben, Diazolidinyl Urea.